Abolishing county gun boards beginning December 1, 2015. 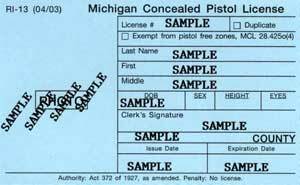 Requiring county gun boards to transfer all license applications and official documents in their possession to the county clerk no later than November 30, 2015. Transferring the bulk of duties from the gun boards to county clerks and MSP. Requiring that a CPL be issued to an eligible applicant. Requiring MSP to verify an applicant’s eligibility. Requiring that an applicant have a valid state-issued driver’s license or personal ID card. Requiring MSP to create an online application process for CPL renewals by December 1, 2018. Revising the process to obtain an emergency CPL. Requiring each county to establish a CPL fund for the deposit of funds collected under the acts. Allowing county clerks to fingerprint applicants. Requiring the clerk to issue a notice of statutory disqualification if the applicant is ineligible, or if the license is suspended due to a violation of the Act or new criminal charge.